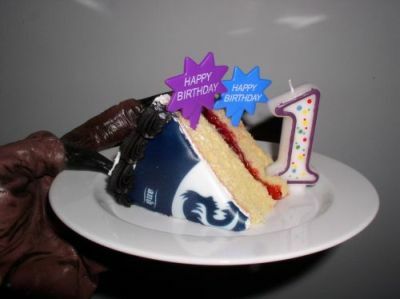 The Werewolf Cafe's 1st Birthday Party! 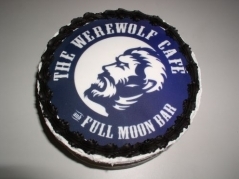 The Werewolf Cafe just had it's first birthday earlier this month, and the event was even celebrated with a special custom birthday cake to commemorate the occassion. Thank you to everyone involved in making The Werewolf Cafe's birthday so special this year! When the air moves it carries with it a sense of the next moment. If you're careful, you can taste the subtle flavor of a coming mood, a rising action, or an approaching close. You might smell the wonder of a revealed possibility or the stink of an inevitable failure. Don't be sad if you can't because most people miss It's hard to separate a dozen different tastes in one moment. Especially when that's how long they last. The honey of a close at hand victory, the salty, fetid aroma of impending ruin, all with a hint of warm apple pie possibilities. Marianne's kitchen was thick with the mingling odor of all these. Although, the last was possibly just in the minds of her and Vincent. Wade Canfield was not much for pastries these last few months. He had a tooth, other than sweet, that ached daily for a soak in blood. Now, sitting at Marianne's table across from Vincent, he could smell the honey. With a smile and a nod, he raised his cup of Mountain Dew to Marianne saying, "Thank you very much. It's been a long time since I had one of these." "Not a soda fan?" Marianne asked. She stayed on the other side of the room, as far from Canfield as she could. Her back was pressed against the refrigerator door, but what she really wanted was to crawl inside. Any nervousness she felt about Vincent earlier erased as soon as Wade stepped across her threshold. The man radiated malice. It was as if every poor in his body screamed of contempt for what stood before him. Though his face showed nothing but a pleasant smile, his eyes had a hungry look. Slow and observant, his cold gray orbs scanned every second for weakness. "Water and coffee usually do me just fine," Wade said with a smile. The unusual amount of long canine teeth in his grin made Marianne shiver. In a way, he looked much like Vincent. His leather vest - his only form of shirt at present - and jeans looked too big for him. His face was well near a beard, and the hair on his head was a mangy thicket of dishwater blonde. However, he had no shoes at all, which Marianne found a bit odd. The soles of his feet must have been heavily calloused though because his heels thudded almost like boots when he walked across the tile floor. Canfield looked around the room, turning in his chair to view the entire space. He nodded his head and sipped his drink. Looking back over at Vincent he said, "It's been awhile since I was in a home like this. This place is nice." With a wink he added, "I wouldn't mind staying here myself." "No vacancies." Vincent said in a low tone. "I was just saying," Canfield lost a touch of the congenial in his voice. His nose crinkled in disgust for a minute as he muttered something into his cup. Downing the rest of its' contents in one gulp, he swallowed his rage with the drink. "So how do you know Vincent?" Marianne asked. She took a step forward and placed a hand on Vincent's shoulder. Somehow, he had begun to feel comforting since Canfield's arrival. In the pit of her stomach she still felt he was in some way off, but there was an air about Wade that would make a grizzly nervous. "We go way back. I'm part of the reason he ain't been home in too long." There was nothing cordial in Wade's smile anymore. Vincent reached up to take Marianne's hand. He gave her a light squeeze. She squeezed back before he moved his hand away. Vincent took in a deep breath and let it out slow. "I think it's about time for me and Wade to be heading off," Vincent said getting to his feet. "It's not that late," Canfield chuckled, leaning back in his chair. Scratching his stomach, he cocked his head to one side. Sniffing the air caused his lips to slide back over rows of teeth glistening with saliva. When he spoke, a roll of drool tumbled down his chin, "I forgot you had a kid. Or did I? It's kinda hard to think right now." "Which is why it's time to go." Instead of turning around, Vincent took a step back so he could get Marianne and Wade in his line of sight. Keeping one eye on Canfield Vincent turned a quick glance over at Marianne. His memory sketched her as swiftly as it could then locked its' drawing away. "Will you be back?" Marianne turned around to face Vincent. It didn't feel safe, but it was better than looking at the man. She could still feel Canfield's eyes. They were like hands not quite touching, but you could still feel the cold coming off them. "I hope so." Vincent risked a smile. She placed a hand on his chest. Knowing there might not be another chance, he risked a kiss on the lips. She pressed forward to make it last longer, but the moment passed. "Now isn't that sweet. â€˜I hope so.' Kisses. How romantic," Wade mocked. He thrust himself forward on the table, smacking his hands down. Drumming his fingers on the table he said, "This is indeed a family moment. We should get the whole family in on this." "I'm not waking up my son in the..." Marianne began but Canfield cut her off. "I'm not talking about your family. I'm talking about ours. Me and Vinnie's." Marianne knitted her eyebrows together. She would have asked for an explanation but a sound distracted her. At first it was just something akin to heavy breathing, the loud intake and exhale of a large animal. Then it was accompanied by a scratching noise. Turning her head towards the two she froze, her brain shutting down in shock. "Amy's here," Wade said grinning. The whole house shook as something collided with the front door. Canfield got to his feet, "And that would be Bill covering the front door." Marianne stumbled backwards. She might have fallen if she hadn't walked into the kitchen sink. Leaning all her weight back on the kitchen counter, she tried to catch her breath. The sound of her heart beating in her ears made it difficult to focus. Canfield was saying something, but her brain was having trouble functioning. That thing at the backdoor had overloaded it. Especially because when she looked at it, she felt oddly similar to how she felt around Vincent. As her mind started to work again, she caught snippets of an argument Vincent and Canfield were having. "He was wrong and you know it, Wade." "That may be. But you were more wrong. YOU HAD NO RIGHT"
"What was I supposed to do? Just watch him tear her apart?" "Yes. How do you think he got the nickname Ripper? That's what he does." "Don't you mean did?" Vincent's voice started to take on more of a growl. "And coming into my family's home isn't bothering me in the slightest." "You might have a point if I cared. "Canfield almost sounded like he was barking when he spoke. "Dad?" Evan asked from the bottom of the stairs. Awoke by Bill hitting the front door, then aroused further by the argument he heard in the kitchen, Evan had made his way downstairs. One of the voices he half recognized, and now, seeing the man's face for the first time in years, he had to ask to be sure. "Evan." All the growl went out of Vincent's voice. In fact, a bit of tremble had snuck its' way in. "Hello little one." None of the animal had left Wade's utterance. His words came in a guttural growl that sounded only on the fringe of human. He turned to face Evan. The boy took a step back up the stairs. Canfield's fingernails fell off as new nails, much like those on the thing at the backdoor, grew in their place. He took a step towards the stairs. Without a word, Vincent flipped the kitchen table over with one hand. He charged forward and grabbed Canfield around the chest. Wade broke free, but not before Vincent could grow talons of his own. When his arms were pulled away, he left cavernous red trails. Canfield fell to his knees, swearing, and clutching at his wounds. Vincent glanced at Evan to see if the boy was all right. One look into the eyes of his father, shining yellow like the ones he'd seen before, was enough to send the boy running back upstairs. Regaining some of her sense, Marianne snatched up a butcher knife from a drawer. She held the handle firmly in both hands. She kept the point shakily aimed at Vincent. Seeing her, white with fear, eyes set to steel determination, Vincent started to speak but Canfield's blood hit his nose with hurricane force. Blood itself was not normally a trigger, but the blood of an enemy could set all reason to instinct. In one well practiced motion, Vincent stepped out of his shoes. There was a set of sounds like bones breaking and meat tearing. Vincent's face distorted with pain for a second then eased into a kind of relaxed acceptance. His form twisted and swelled. Dark brown hair grew out all over his body. His head extended and angled until it was more wolf than man. Within a minute, he had doubled in size and now stood about eight feet tall. Marianne held her ground. She felt like it would have been easier just to faint, but held on to consciousness with every ounce of energy her mind still had left. "BILL, AMY, WHAT THE HELL ARE YOU WAITING FOR?" Canfield bellowed. The front door immediately began to splinter. There was a crash of glass from the backdoor. Marianne turned her head just in time to see a dark blur move through the living room towards the stairs. The shape collided with Vincent. The brown and gray rolled around together, growling, thrashing, and biting. It only took a few seconds before it was done. Vincent lay on all fours over his kill. His hands and face red with gore. What remained of Amy now twitched as the little that was left of life in her drained. Vincent kept his eyes fixed on the front door. Instead of smashing entirely through, Bill had tried to wiggle through the first opening he made. His massive frame was now stuck half in, half out of the house. Still, he thrashed and maneuvered to get further. With slow steps, Vincent crept towards him. With his one free hand Bill slashed at the air. Vincent squatted down, waiting for the right moment. Bill gnashed his teeth together, long strands of drool dangling off his lips. He let out what could be considered a sigh, and Vincent struck. One bit to the throat, followed by a pull, and it was done. Marianne crept around the corner, knife in hand. She could see Vincent's eyes glowing in the shadows. He came forward, the wolf receding back into the man. Walking past her without so much as a look, he gathered up his shoes and the pictures she had picked out of Evan. With his back to her he said, "Go upstairs. I'll clean up all this." "Okay." Marianne kept the knife in hand as she went up the stairs. Canfield watched her go up every step. "I knew I shoulda come in, guns blazing," Wade said coughing. "Hindsight is always twenty/twenty," Vincent replied. He kept his attention on knotting his shoelaces together around a belt loop. His belt had broken in the change. It was a minor issue, but one he took note of. "So what now?" Canfield felt cold. He knew he could pull through this. His wounds were bad, however, he'd had worse. But there was no way Vincent would let that happen. Mercy is always the downfall of the ignorant. Wade's first stop would be here for Marianne and Evan. Then he'd come after Vincent. The next time he'd get it right. Wade knew that. Vincent did too. "I'm gonna kill you, Wade. Then burying you all." "What about them?" Canfield said, nodding his head towards the upstairs. "Guess I'm gonna have to stick to my memories." Vincent sighed, "I don't want to remember the way they looked at me tonight."